…and how could I not include everyone’s favorite Mad Men bed! “Turquoise slumbers fill your eyes. Smiles awake you when you rise.” Sorry, I couldn’t help it! 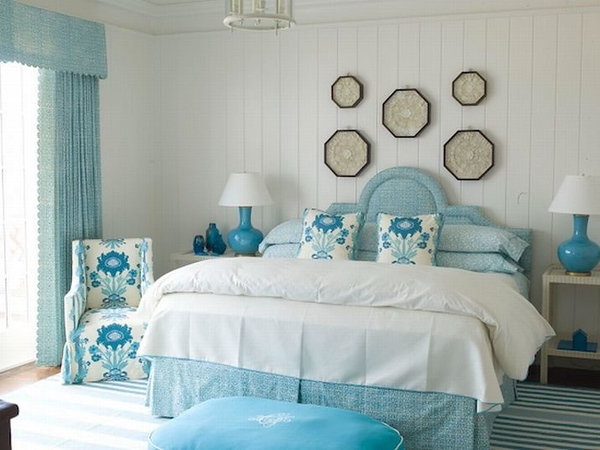 As much as I’m dying for a canopy bed, I equally lust after a turquoise upholstered bed. I just can’t recall one turquoise tufted headboard that I’ve found unattractive. I think the only reason I wouldn’t get one is because I’m constantly changing the bedding in my room, and I love the blank canvas appeal of a naked canopy bed. 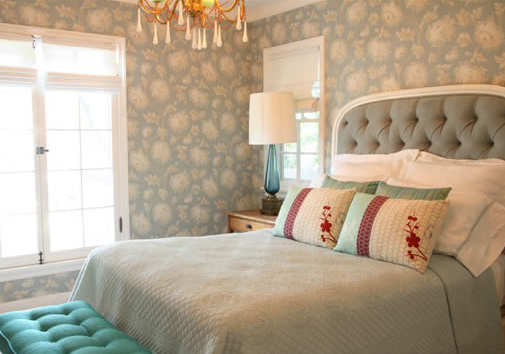 Maybe one day I can have a guestroom with a dreamy turquoise bed, then just sit in there and stare at it all the time. Until then, I’ll have this post to go back to! How do you do this!!! Every image is fantastic. You are the best. Loved this post. I have to go back and look yet again. Oh, they are all so gorgeous! Now which one will I choose for this evening? The Phoebe Howard bed suits me right now. Lovely post. Love love love! So glad you have the headboard from Mad Men. I've been in love with that one since the show started! so many beautiful images to store away for my next house! all beautiful… and I love the polka dot bench in the 5th image!! Actually I love that whole room! GORGEOUS GORGEOUS GORGEOUS! I love turquoise! hola erin!!! l always soorprise! !the turquoise is so so great that always is beautifull with differnt colours,diferent styles!!! l love it!! !thanks and thanks for sharing this images!!!! have also a happy weekend!!!!!! These are amazing! And if anyone ever finds a headboard like the one in Mad Men (or a tutorial to D-I-Y one), please, please let me know! That red and turquoise room has been tucked away in my idea files for a long time. I absolutely LOVE that room! Nice to see it again! Sure wish I lived there! This makes it official, I am obsessed with upholstered beds. These are all just splendid. Love! Love this post! I could bookmark almost all of your posts. 🙂 Betty and Don Draper's headboard on Mad Men is so chic! One of my favorite tv bedrooms. I'm so happy to be getting my dose of turquoise for the week. I'm moving and god knows I need it. I love that first image! omg how am i ever going to decide what bed to buy??? i love them all! I'm jumping up and down and dreaming too. Gotta link back to you for this one…..
Amazing photos, as always 🙂 Have a wonderful weekend! The pictures are all so beautiful, but the Mad Men picture at the end…perfect. Gorgeous rooms, all – but my all-time fave is #8 (hope I counted correctly) with the olive bedspread. I fell in love with that when it was in HG (or Elle Decor) several years ago – lost the magazine and thought I'd lost it forever! Bless you! Happy belated birthday and happy weekend! LOVE them all! Great post. I needed bedroom inspiration, badly. Happy Belated Birthday!!! Hope it was great! As usual, love them all; however I was particularly drawn to the paisley wall design in the first pic. It is very similar to a stencil design I've been admiring for some time. Hmmmm I will have to blog about that real soon. completely lost my breath on that first image! Stunning! and i adore the image, the glam lamb! so sweet. love, love, love this post! i can't tell you how many times of elbowed b while watching mad men and telling him i WANT that headboard. it's beautiful. these are all gorge but i would love to have the first one as my bedroom. I love that wall paper. hope you are off to a great week. Swoon!! I would just love a tufted headboard!! I've loved that Mad Men bed since the first time I saw it. The combo of tufted headboard + chandelier, sputnik fixture, or other striking light fixture is such a special look for a bedroom.